Sada Jinja is a Shinto shrine in Matsue, Shimane Prefecture, Japan. 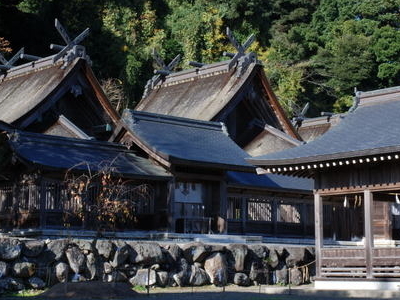 The Taisha-zukuri north, central and south halls of 1807 are Important Cultural Properties.Sada Shin Noh, ritual purification dances performed annually on 24 and 25 September, have been designated an Important Intangible Folk Cultural Property.In 2011 Sada Shin Noh was inscribed on the UNESCO Representative List of the Intangible Cultural Heritage of Humanity. Here's the our members favorite photos of "Shrines in Daisen-Oki National Park". Upload your photo of Sada Jinja!